Imagine a world where erotica was written by feminists: Their daydreams include equal pay, a gender-balanced Congress, and Tom Hardy arriving at their doorstep to deliver a fresh case of LaCroix every week. 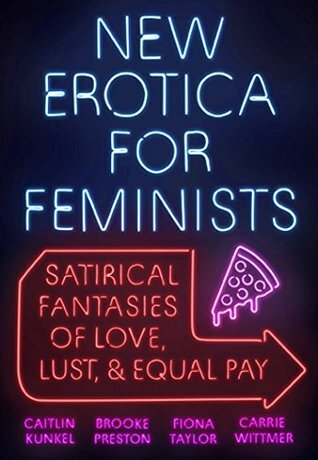 Both light-hearted and empowering, New Erotica for Feminists is a sly, satirical take on all the things that turn feminists on. From a retelling of Adam and Eve to tales of respectful Tinder dates, New Erotica for Feminists answers the question of “What do women really want?” with stories of power, equality, and an immortal Ruth Bader Ginsburg. I don’t even remember where I first saw New Erotica for Feminists, but I’m like 99% sure it was on someone’s blog. If you’re that person, thank you so much for talking about this book! I put a hold on it at my library right after reading that review and read it the same night that it came in. I don’t think it took me more than an hour or so to get through this book, and I’m so glad that I read it. This was just such a fun way to spend an evening! I wouldn’t say my world was shattered by its amazingness or anything, but I really enjoyed it and I’d happily read something else from these authors. Have you read New Erotica for Feminists? Have you read any short story collections like this one? It was great! I hope you get the chance to read it! I want to read this! Great review!! Thanks! I hope you like it as much as I did! Oooh this sounds interesting and a bit fun! I have this book on my TBR. I also can’t remember where I saw it, but am also pretty sure it was on someone’s blog. I’m excited to here that it was good. How sexist!! Why Tom Brady? Real men have curves…and they do not deflate their balls. I think I just posted so I could add that last part. With your examples alone, this sounds like a super fun read! I hadn’t heard of it before, but it’s definitely on my radar now! I hope you like it if you end up reading it! It was definitely a lot of fun. I finally had a chance to read this based on your review. I enjoy quality, unforced feminist literature, so I had high hopes and expectations. I think it was quite interesting. I think about 50% are spot on and edgy, 25% tried to fit too hard and missed the mark, and another 25% were somewhere in the middle. I think Nikita Gills’ Fierce Fairy Tales did a better job being feminist literature while also not plugging in wording that seemed forced to fit a desired dialogue at times. A female friend read it alongside me and felt the same. It is a fast read, so not hitting the mark 100% is not a deal breaker. I ended up giving it a 3.5. I’ll have to take a look at Fierce Fairy Tales. That sounds like something I’d really enjoy!